Ames scientists Michel Nuevo, Christopher Materese and Scott Sandford reproduce uracil, cytosine, and thymine, three key components of our hereditary material, in the laboratory. They discovered that an ice sample containing pyrimidine exposed to ultraviolet radiation under space-like conditions produces these essential ingredients of life. "We have demonstrated for the first time that we can make uracil, cytosine, and thymine, all three components of RNA and DNA, non-biologically in a laboratory under conditions found in space," said Michel Nuevo, research scientist at NASA's Ames Research Center, Moffett Field, California. "We are showing that these laboratory processes, which simulate conditions in outer space, can make several fundamental building blocks used by living organisms on Earth." An ice sample is deposited on a cold (approximately 430F) substrate in a chamber, where it is irradiated with high-energy ultraviolet (UV) photons from a hydrogen lamp. The bombarding photons break chemical bonds in the ices and break down the ice's molecules into fragments that then recombine to form new compounds, such as uracil, cytosine, and thymine. "Molecules like pyrimidine have nitrogen atoms in their ring structures, which makes them somewhat wimpy. As a less stable molecule, it is more susceptible to destruction by radiation, compared to its counterparts that don't have nitrogen," said Scott Sandford, a space science researcher at Ames. "We wanted to test whether pyrimidine can survive in space, and whether it can undergo reactions that turn it into more complicated organic species, such as the nucleobases uracil, cytosine, and thymine." 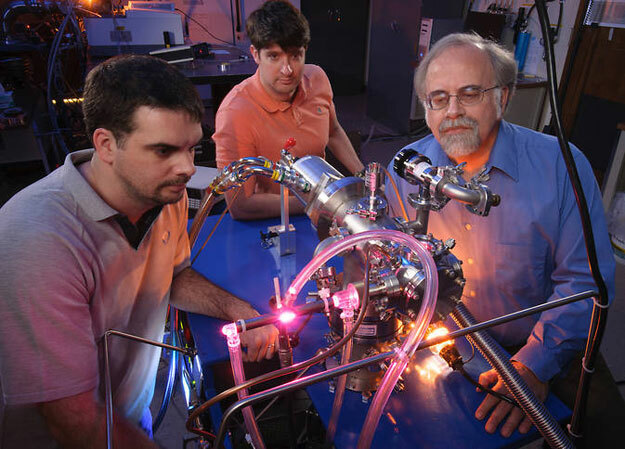 Scientists tested their hypotheses in the Ames Astrochemistry Laboratory. During their experiment, they exposed the ice sample containing pyrimidine to ultraviolet radiation under space-like conditions, including a very high vacuum, extremely low temperatures (approximately 430F), and harsh radiation. "We are trying to address the mechanisms in space that are forming these molecules. Considering what we produced in the laboratory, the chemistry of ice exposed to ultraviolet radiation may be an important linking step between what goes on in space and what fell to Earth early in its development," said Christopher Materese, another researcher at NASA Ames who has been working on these experiments. "Nobody really understands how life got started on Earth. Our experiments suggest that once the Earth formed, many of the building blocks of life were likely present from the beginning. Since we are simulating universal astrophysical conditions, the same is likely wherever planets are formed," says Sandford. Additional team members who helped perform some of the research are Jason Dworkin, Jamie Elsila, and Stefanie Milam, three NASA scientists at NASA's Goddard Space Flight Center in Greenbelt, Maryland.